Situated near the mouth of the Dart on a deep and safe harbour Dartmouth has great topographical and historical interest, and clearly has had and continues to have lively residents and visitors in literary and art fields. It has been the venue for the Annual Meeting five times before this and so it is possible to read how the DA appreciated it at intervals between 1869 and 1991. It was also the subject of the fifth of the DA’s Parochial Histories published in 1935 as a hefty and most thoroughly researched volume transcribing all the available surviving legal and other records involving the merchants and borough over the preceding centuries. Few of the early travellers who wrote of visiting Devon towns seem to have visited Dartmouth but we can read Daniel Defoe’s excited observation of being on the water when an incoming rush of pilchards caused ‘uproar’ in the harbour and town, and his comments on how plentiful and cheap fish and lobsters were, being driven in by porpoises from the sea often as far up river as Totnes. He was impressed by the prosperous merchants trading with Spain, Portugal and the Plantations and especially with Newfoundland. Nowadays Dartmouth has a very active community of writers who meet at the Flavel centre as the Writers Group of the flourishing Dart Valley U3A, encouraging and supporting each other to a wide range of work from poems to plays for broadcasting. They run an active web site where we can all read examples of their work and even add comments; clearly an outward looking U3A group. Earlier writers associated with Dartmouth include Agatha Christie who lived just up-river at Greenway but of whose huge literary output only one short story, “The Regatta Mystery” is set in Dartmouth. Earlier Flora Thompson lived and wrote in the town to which her husband had been appointed as Postmaster in 1928. And more recently Christopher Robin Milne ran a successful bookshop here, selling a wide variety of books but especially those written by his father, and also writing autobiographically, “The Enchanted Places” in 1974 followed by three more. and he might well have been, as Chaucer knew the town well having three times visited it as a customs officer for Edward lll, meeting the merchants who were so successfully building up the port. The greatest of these were the John Hawleys, the father being likeliest model for the Shipman, who developed a fleet of cogs, built mills and housing. The son built more including a chapel to the church, was mayor five times and even, more reprehensibly, a privateer. In all these roles they were later described by John Prince in his Worthies of Devon. Not surprisingly Dartmouth has attracted many painters. Turner, who visited in 1811 and 1814 and no doubt made many sketches, later painted a view of early morning activity across the harbour with the sun rising behind Kingswear. 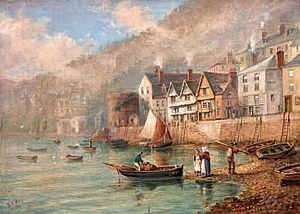 In 1840 William Hopkins Way, one of the then developing Dartmouth School of Artists, painted views out between the headlands and inwards to the harbour. Early in the twentieth century H.B. Wimbush was commissioned to paint watercolours of Dartmouth scenes for reproduction as postcards. Dartmouth has several Art Galleries exhibiting work of local artists and others some of whom are members of the flourishing Dartmouth Art Society which has recently celebrated its first 25 years. Members meet weekly between September and May at the Townstal Community Centre to paint and exchange ideas and for demonstrations and workshops. The Arts Society – Dartmouth and Kingswear, founded in 2000, has a varied programme of lectures at the Flavel Centre. In June we will be able to include slides of many paintings as part of the Section’s short presentation at the Annual Conference. Between events at the Conference members may be able to visit the various galleries and certainly that of Simon Drew who will have been the Section’s speaker in March.